Scion of the Void has a distinctly Lovecraftian feel to it. Tentacles, four arms, and a mysterious book add to this image. 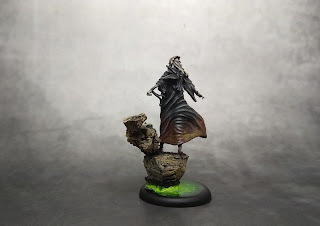 I was asked to use "floating island" type of base for this mini so that's what I came up with. Painting his black robe was a challenge as it comprises the major part of the mini. I used more contrasting highlights on the folds of the material and added some dry pigments on the edges. 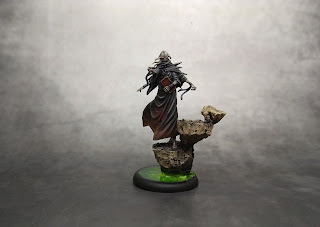 Scion is a thematic henchman for Tara but he can also be used in other Outcast teams for burying key models and throwing them in the opponent's face (Viks come to mind immediately). He's also hard to hit as he gets to discard a card and bury whenever targeted.